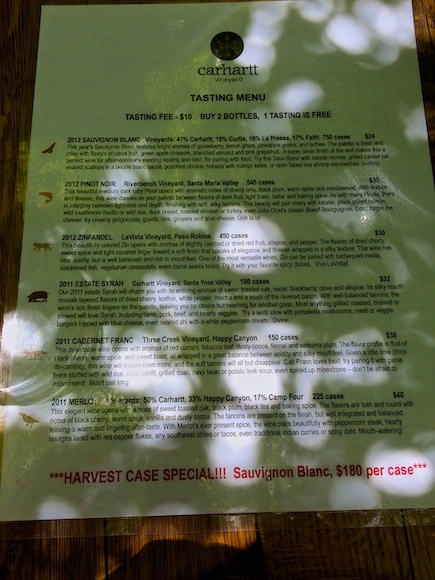 We stumbled upon Carhartt Vineyards when we were looking for a lunch spot in Los Olivos one afternoon. We’re so glad we did. Was it the Bob Marley music playing from the patio? Maybe. 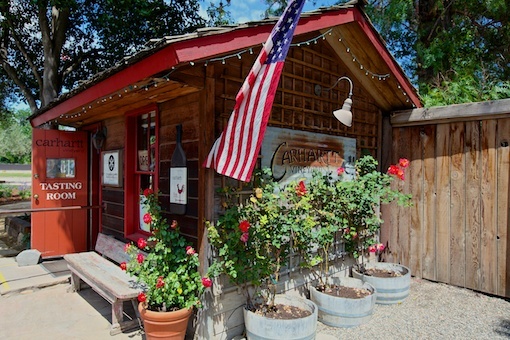 Was it the intriguing thought of having wine at the “World’s Smallest Tasting Room”? Could be. All we know is this place was one the more unique wine tasting experiences we had. Everything here is laid back and it’s almost like a family party. And, yes, the wines were great, too! 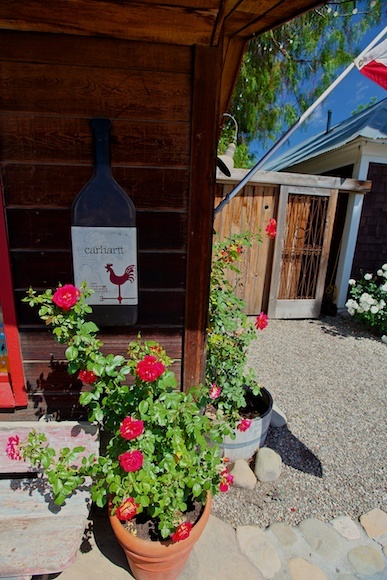 Located at the end of Grand Avenue in Los Olivos, you can’t miss the “red shed” that is the Carhartt Vineyards wine tasting room. You can fit about 6 or 8 people shoulder to shoulder. Even that may be optimistic. 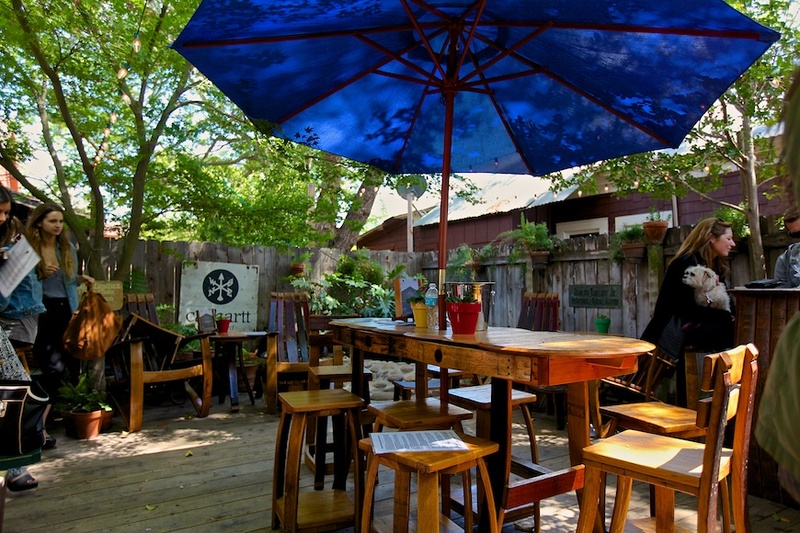 But the patio, wow. A tree covered oasis where you can easily fit about 40 people. The atmosphere is great, the wine flows freely and the service and knowledge of the pourers are top notch. But they should be. More often than not, it will be a Carhartt or member of the Carhartt family who’ll be doing the pouring. 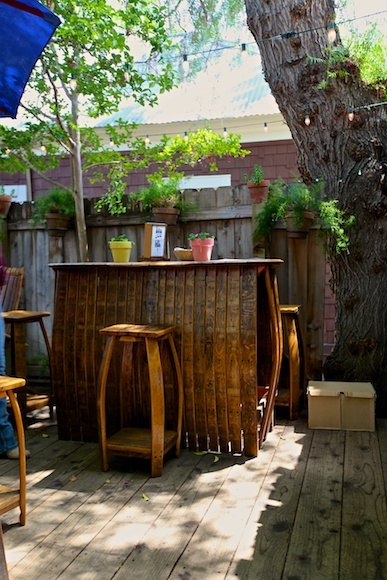 Based upon the crowds when we visited on a Saturday afternoon, this is one of the hottest spots to be in Los Olivos. Carhartt (yes, they’re part of THAT Carhartt family) has a wide selection of wines that are reasonably priced. It’s probably better to say exceptionally priced for the quality of the wine. 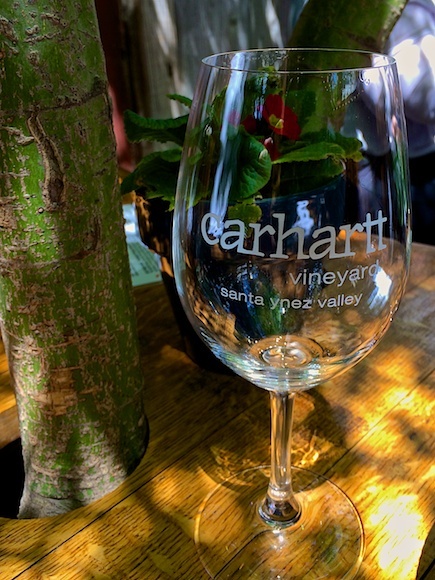 Carhartt grows merlot, syrah, sauvignon blanc, grenache and petite syrah on 10 acres in the Santa Ynez Valley and also Sangiovese at nearby 11 Oaks Ranch. All of their wines are great. It’s really hard to pick a favorite. The whites were really great and the reds were as well. If we had to pick a favorite, it would probably be the Grenache Blanc and the Merlot. Whites are in the $20-$30 range and most reds are $30-$40. They have a great wine club, where you can buy as few as two bottles in quarterly shipments. There are four tiers in the wine club. We joined the club because it’s such a great value. And in addition to getting great wines on a regular schedule, you also get invitations to their renowned “Pick Up Parties” and their Annual Wine Maker’s dinner held at the winery itself. Another unique thing about Carhartt is that they have a retreat house you can rent nightly at their 11 Oaks Ranch. It’s super-luxe and wine club members get a discount. You can check it out in the video below.